This delightful array of cheery Gerberas are the perfect alternative to the traditional Roses option. 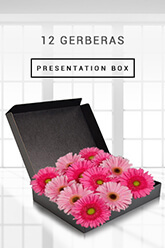 They are delivered in a stylish presentation box with delicate tissue paper. When the lid is opened we guarantee instant smiles. You just cant help smiling when you see Gerberas!If you wish to make a fantastic impression, may we suggest that you add the Superior Box of Chocolates to your flower bouquet order and let your special someone take pleasure of enriching all the senses; sight, touch, smell and taste! Flowers arrived on time and were received with delight. Thank you for excellent service. My sister in law was very happy, flowers were deliverd in a lovely box which was a pleasent surprise. Not to mention the quick delivery. Fantastic service! Flowers arrived in perfect time and my girlfriend loved the flowers, thank you very much! Great service??? ?.thank you..you got yourself a new customer ???? The flowers were fresh and beautiful! My niece was so happy to receive it and said that it was "super nice!" The premium chocolates I ordered with it came in a Lindt Lindor heart-shaped tin can, so I was glad it wasn't some cheap brand chocolate. zFlowers.com delivered on their promise to deliver the next day. It was a last-minute purchase so I was glad to have found this site. Other sites can only promise at most 2 days delivery from date of order, and they're so much more expensive! I've been burned by other sellers who delivered crap flowers and wouldn't refund my money. I will definitely bookmark this site and order from them again! Thanks for being a lifesaver!